Here’s a common situation. You finally get a meeting with a senior or C-Level person. After the pleasantries you start telling how your product or service will be good for his company and/or better than the competitions’ stuff. He’s attentive for a few minutes. But you’re so focused on presenting or your standard spiel, you miss the fact that he’s bored. All of a sudden he’s ending the meeting and you’ve got nothing – no commitment, no interactive discussion, no follow-up meeting. Senior and C-level people don’t care about what you have to offer until they feel you understand their needs and their situations. The only way they’ll feel you understand is if they tell you. This is how they’ll engage with you. 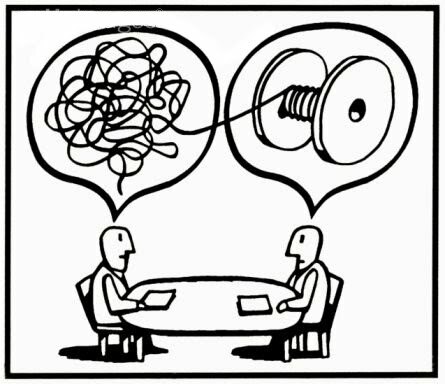 As they do, you clarify meanings and discuss solutions. But keep in mind; they have to lead you to your solution. If you go in thinking you know the perfect solution and start telling him how he can get it with you, you’ll miss the boat on two counts. – First, you may be wrong and you’ll talk about features and benefits he doesn’t care about – even though you think he should. – Second, every senior and C-level person thinks his situation is different than others like him. So how could you possibly know his particular situation and how he wants to handle it? Even though you may have the perfect solution, because you handle similar situations all the time, you’ll risk losing him if he doesn’t spell it out to you. Once he has, you can acknowledge you understand. If you don’t, he’ll feel you’re just trying to push your product/service down his throat the instant you start presenting. So here are some tips to help you engage C-levels and other prospects. 1. Ask these prospects and C-level executives, “What are your challenges, (or issues, or concerns, or desires) as it relates to your situation?” or “How come you’re seeking this information, (or a price or my help)?” These are set-up questions to get him to explain what issues he want eliminated or what he wants to achieve. 2. Don’t worry that he doesn’t know what your product can do. He knows his problems and desires. It’s up to you to ferret out the real pain and then apply what you have to solving those problems. 3. Listen to the words he uses, i.e. higher productivity, or completed quickly, or make his people happy, or beat the competition, or better pricing. Now what’s really meant by these words? Play this game with yourself. If your boss were to ask what he meant by “happy employees,” or “higher productivity,” or “better pricing” how would you explain what was meant? If you’re explanation is vague, you’ll be hard pressed to give a vivid compelling presentation that hits this C-Level person’s hot buttons. In summary, engage a C-levels or senior executives by making it all about them. Let each tell you what he wants and how he wants to get it. The more he does the telling, the more engaged he’ll be. Switching sales people to interviewing mode from presenting mode is very difficult because everyone feels their job as a sales person is to present. It is, but only after you know what the situation is. Think of a doctor or an engineer. They will not prescribe a solution until they investigate the problem from a few different perspectives. Somehow sales people feel if they push their products, the powerful executive will get excited and buy. How do you feel when someone tells you what you should buy and why? Go figure. Additionally, very few ever concentrate on learning from the executive why he wants to go ahead with a project or purchase. They never try to understand where the executive is coming from, his concerns about what others will think, what his perfect vision is or what it means to him if it’s done or not done correctly. So if and when you get the opportunity to speak with a C-level or top executive, you’d better be to their point – not yours – or else his bouncers will get rid of you and never let you enter again.